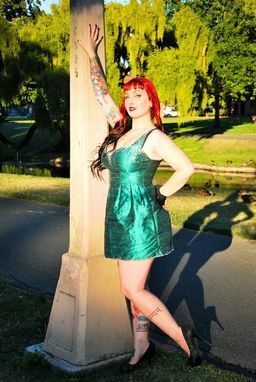 Slinking out of the misty Pacific is Miss Veronica Virgo, Pin-Up Extraordinaire in an iridescent teal to black silk dupioni playsuit with corset seams for the ultimate hug and flare fit. Her seductive little frock is encrusted in Swarovski Crystals along the neckline, straps and hem. You may choose any color you like for the crystals, and the dress itself! We are happy to add more beading for an extra charge. 6-Just below your hips and around the widest part of your rump! Note! I am booking up very quickly, please let me know as soon as you are considering having a dress made for yourself. Don't forget I am a custom couture artist and I am happy to make your wildest dress dreams come true. I don't use patterns, so I can make anything you can think up. Every dress is hand cut by me to flatter your very specific measurements and shape. I use the highest quality natural (non-synthetic) fabrics, and to adorn your dresses are a huge selection of Swarovski crystal beads and rhinestones, freshwater (or saltwater) pearls, vintage sequins and vintage lace and crochet appliques! All My dresses are available as dress kits, which are cut and pinned to your measurements and come with all the notions and directions necessary for you to sew together your very own dress! Its also much less expensive.